With ticket sales and subscriptions covering just 55% of our budget each season, it takes YOU to sustain and propel a non-profit theatre company like TimeLine. We welcome giving by both individuals and institutions, and are pleased to offer various benefits in consideration of your support. THANK YOU for your interest in supporting us with a donation today! If you would like to donate a gift of stock, please contact Elizabeth K. Auman, Managing Director, at 773.281.8463 x35 or elizabeth@timelinetheatre.com to provide the information needed to complete the transfer. TimeLine is occasionally in need of various products and services to support our productions, special events and ongoing work. If you would like to discuss a potential in-kind donation, please contact Elizabeth K. Auman, Managing Director, at 773.281.8463 x35 or elizabeth@timelinetheatre.com. TimeLine is honored to acknowledge the thoughtful donors who have made us a beneficiary of their planned giving arrangements. These gifts help ensure the company’s longevity and success in the years to come. If you have made TimeLine Theatre a beneficiary of your estate, please contact Elizabeth K. Auman, Managing Director, at 773.281.8463 x35 or elizabeth@timelinetheatre.com, so that we may appropriately recognize your generous support. 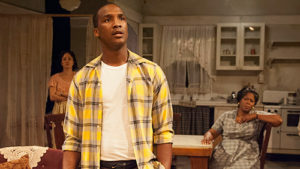 Pictured above (from left): Toni Martin, Jerrod Haynes and Greta Oglesby in A Raisin in the Sun, 2013. "Hop on the ship. Gonna go on a trip. Don't check your mind at the door ..." Watch our "What If" video for more about TimeLine's mission and programs. TimeLine is Chicago’s only theater with a mission to present stories inspired by history that connect with today’s social and political issues. We understand that every donation we receive is an investment, and we take this investment very seriously!